Xbox One Controller Support for PC and a Halo 2 Anniversary hint? Today Larry Hryb aka Major Nelson of Xbox tweeted out the following article on his blog. 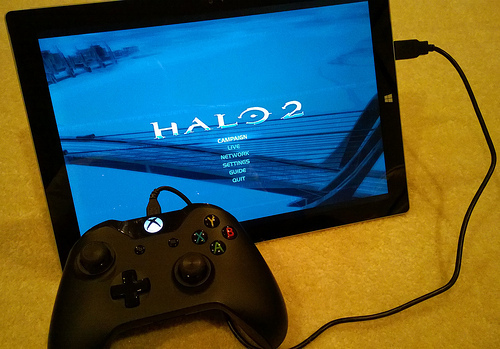 The article portrays a Surface tablet with an Xbox One controller plugged in and on the Halo 2 Menu screen. Not much more than a shameless plug for the Microsoft E3 presentation, however, it’s very strange out of all the games for Windows currently available that they would choose Halo 2. Am I reading into this too much? Most likely, but it could be a tease to a bigger reveal at E3. Time will only tell if we get our grubby hands on Halo 2 Anniversay this year.